Note: The Docker Daemon check is still maintained but only works with Agent v5. To use the Docker integration with Agent v6 consult the Agent v6 section below. Visualize and monitor Docker_daemon states. Be notified about Docker_daemon failovers and events. To collect Docker metrics about all your containers, run one Datadog Agent on every host. There are two ways to run the Agent: directly on each host, or within a docker-dd-agent container (recommended). For either option, your hosts need cgroup memory management enabled for the Docker check to succeed. See the docker-dd-agent repository for how to enable it. Enable the Docker integration tile in the application. Create a docker_daemon.yaml file by copying the example file in the agent conf.d directory. If you have a standard install of Docker on your host, there shouldn’t be anything you need to change to get the integration to work. To enable other integrations, use docker ps to identify the ports used by the corresponding applications. API_KEY Sets your Datadog API key. DD_HOSTNAME Sets the hostname in the Agent container’s datadog.conf file. If this variable is not set, the Agent container defaults to using the Name field (as reported by the docker info command) as the Agent container hostname. DD_URL Sets the Datadog intake server URL where the Agent sends data. This is useful when using the Agent as a proxy. LOG_LEVEL Sets logging verbosity (CRITICAL, ERROR, WARNING, INFO, DEBUG). For example, -e LOG_LEVEL=DEBUG sets logging to debug mode. TAGS Sets host tags as a comma delimited string. Both simple tags and key-value tags are available, for example: -e TAGS="simple-tag, tag-key:tag-value". EC2_TAGS Enabling this feature allows the agent to query and capture custom tags set using the EC2 API during startup. To enable, use -e EC2_TAGS=yes. Note that this feature requires an IAM role associated with the instance. NON_LOCAL_TRAFFIC Enabling this feature allows StatsD reporting from any external IP. To enable, use -e NON_LOCAL_TRAFFIC=yes. This is used to report metrics from other containers or systems. See network configuration for more details. SD_BACKEND, SD_CONFIG_BACKEND, SD_BACKEND_HOST, SD_BACKEND_PORT, SD_TEMPLATE_DIR, SD_CONSUL_TOKEN Enables and configures Autodiscovery. For more information, see the Autodiscovery guide. Note: Add --restart=unless-stopped if you want your agent to be resistant to restarts. The standard Docker image is based on Debian Linux, but as of Datadog Agent v5.7, there is an Alpine Linux based image. The Alpine Linux image is considerably smaller in size than the traditional Debian-based image. It also inherits Alpine’s security-oriented design. Starting with version 5.5.0 of the Datadog Agent, the Docker image follows a new versioning pattern. This allows us to release changes to the Docker image of the Datadog Agent but with the same version of the Agent. The Docker image version has the following pattern: X.Y.Z where X is the major version of the Docker Image, Y is the minor version, Z represents the Agent version. For more information about building custom Docker containers with the Datadog Agent, the Alpine Linux based image, versioning, and more, reference the docker-dd-agent project on Github. Run the Agent’s status subcommand and look for docker_daemon under the Checks section. The url, api_version and tags* options are deprecated, direct use of the standard Docker environment variables is encouraged. The ecs_tags, performance_tags and container_tags options are deprecated. Every relevant tag is now collected by default. The collect_container_count option to enable the docker.container.count metric is not supported. docker.containers.running and .stopped should be used. collect_labels_as_tags has been renamed docker_labels_as_tags and now supports high cardinality tags, see the details in datadog.yaml.example. exclude and include lists have been renamed ac_include and ac_exclude. To make filtering consistent across all components of the Agent, filtering on arbitrary tags has been dropped. The only supported filtering tags are image (image name) and name (container name). Regexp filtering is still available, see datadog.yaml.example for examples. The docker_root option has been split in two options container_cgroup_root and container_proc_root. exclude_pause_container has been added to exclude paused containers on Kubernetes and Openshift (defaults to true). This avoids removing them from the exclude list by error. The TAGS environment variable was renamed to DD_TAGS. The Docker Hub repository has changed from datadog/docker-dd-agent to datadog/agent. The import command converts the old docker_daemon.yaml to the new docker.yaml. The command also moves needed settings from docker_daemon.yaml to datadog.yaml. (gauge) The amount of non-cache memory that belongs to the container's processes. Used for stacks, heaps, etc. docker.service_up: Returns CRITICAL if the Agent is unable to collect the list of containers from the Docker daemon, otherwise returns OK.
docker.container_health: This Service Check is only available for Agent v5. It returns CRITICAL if a container is unhealthy, UNKNOWN if the health is unknown, and OK otherwise. docker.exit: Returns CRITICAL if a container exited with a non-zero exit code, otherwise returns OK. Note: To use docker.exit, add collect_exit_code: true in your Docker YAML file and restart the Agent. 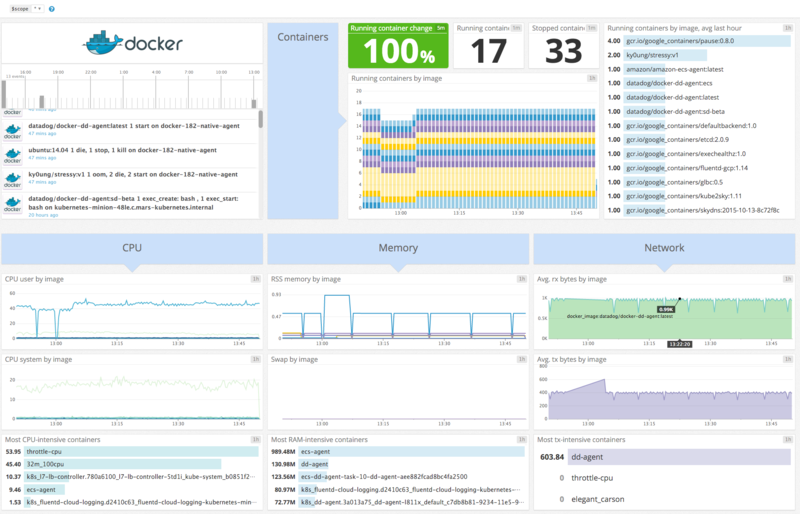 Learn more about how to monitor Docker performance metrics with our series of posts. We detail the challenges when monitoring Docker, its key performance metrics, how to collect them, and lastly how the largest TV and radio outlet in the U.S. monitors Docker using Datadog.